Less than two weeks remain before the official National Day of Action on food safety! We’ve been hearing from folks all over the country, with events planned not only on October 20th, but all throughout the next month. It’s amazing to see what the beginning farmer network is capable of! SHOW your event to the world! 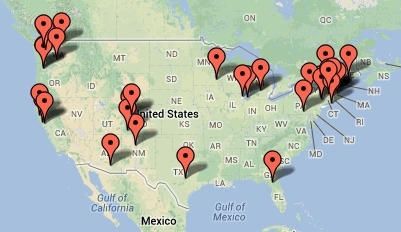 NYFC’s action page now has a map of all the events happening around the country. Take a look to find something happening near you. (Nothing there yet? Click here to get in touch with us about organizing an event!) We’ve got dozens of events up already, and more pouring in. Take a look for an inspiring nation-wide effort for change. Brand-new analysis of the FDA’s proposed regulations and in-depth recommendations are now available! We have been working as a part of a team of researchers, lawyers, and farming advocates to disect the rules, point by point. Over 3,500 pages have been distilled down into a readable report on how the regulations will directly impact the farming community. Then, based on input from our member survey (thanks to those who took part! ), we now have recommendations on how each of these regulations could be improved. Don’t forget, though, that your unique perspective is the most critical part of your comment. Whether you are an organic vegetable CSA in New Mexico, a biodynamic operation in Ohio or a urban farm in Seattle, these rules will impact your operation differently, and your comments to the FDA need to reflect that. NYFC’s background and recommendations report is intended as a jumping-off point for you to think about your farm and what changes you need. Hang out with an Expert! Last, feeling like the background report isn’t quite enough? We were lucky enough to score two hours with Ariane Lotti, farm policy extraordinaire from the National Sustainable Agriculture Coalition, to chat with the beginning farmer community about how the regulations will impact us. 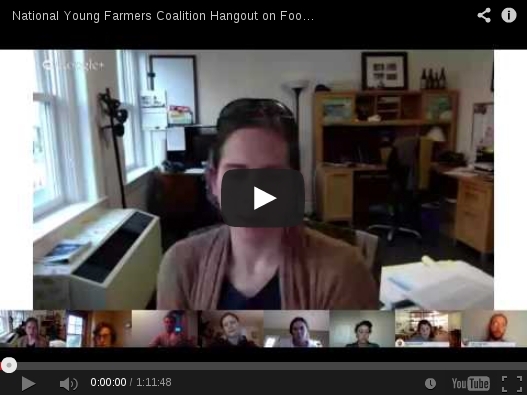 Those Google Hangouts are permanently saved on NYFC’s action page, so take a look! Each video starts with a comprehensive review of the rules and then opens up to Q&A from a panel of diverse farmers. So that’s the latest on the National Day of Action. Take a look, get informed and take action!